A couple of months ago, I agreed to take on the management of my small consulting firm’s digital strategy development, which will include the complete redesign of our Web presence. This is a daunting and exciting challenge given that I also have my “day job” to do – delivering strategic communication support for public and private sector clients. In addition to this, for my Using Social and Digital Media class as part of my masters’ degree at Johns Hopkins University, I’ll be working on developing a social media plan for the American Petroleum Institute. 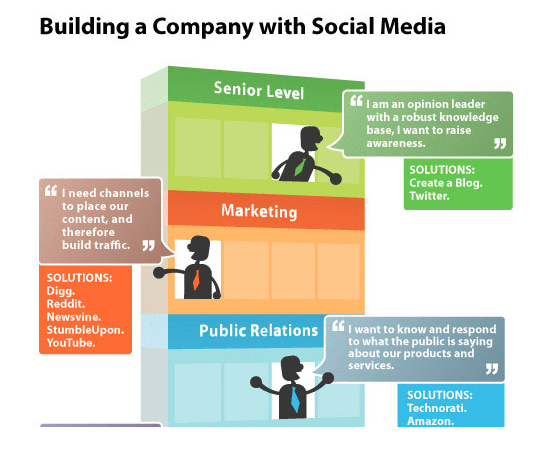 This Building a Company with Social Media infographic from Honkiat.com and Elliance portrays needs across organizational departments and potential technology solutions. So, when I picked up The Groundswell – by Josh Bernoff and Charlene Li – and began to read it, my interest was instantly peaked. Bernoff and Li wrote The Groundswell as a guidebook for marketing and communication professionals seeking to harness the power of social media for their organizations. According to the authors, the groundswell is “a social trend in which people use technologies to get things they need from each other instead of from companies”. According to Bernoff and Li, the three key influencers of the groundswell are people, technologies, and economics – with people as they key driving force. The authors divided the book into three parts. In part 1, the authors focused on explaining the phenomenon that is the groundswell. The book began by describing how a jujitsu master harnesses an opponent’s energy and uses it to his advantage. According to Bernoff and Li, companies can act much like the jujitsu master and turn the groundswell to their advantage. They noted that first, you must understand the force of the groundswell: this force is about relationships, not technology. To this end, the authors introduced the way for companies to understand their key audiences and their motivations: through Forrester’s Social Technographics Profile. They noted that people participate in groundswell activities for various reasons and at various levels. The picture below depicts Forrester’s Social Technographics Ladder. 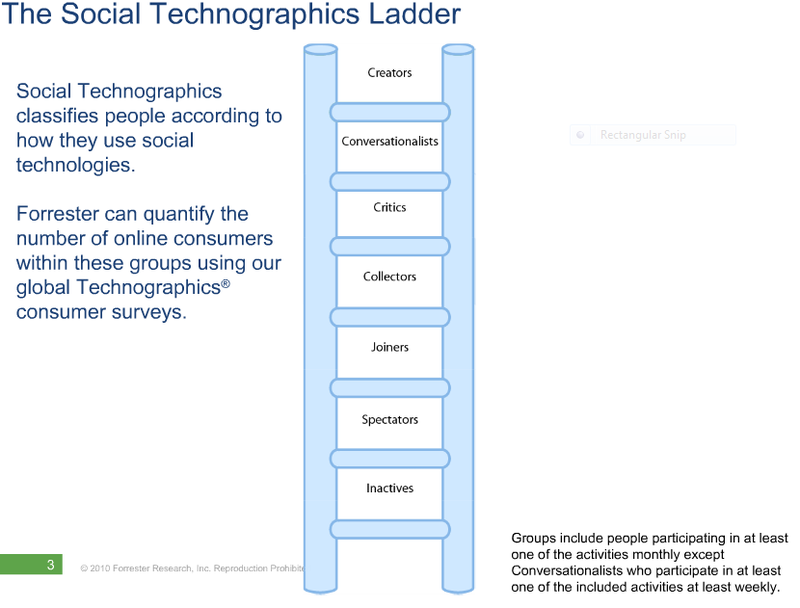 The Forrester Social Technographics Ladder depicts the various levels of social media user involvement. In Part 2, the authors went on to explain how companies can tap the groundswell using five strategies: listening, talking, energizing, helping, and embracing. Bernoff and Li also introduced their “POST” approach – comprised of people, objectives, strategy, technology – which they called the “foundation of groundswell thinking”. Finally, in Part 3, the authors shared how companies can transform from the inside out using social media to engage employees. At this point in the book, Bernoff and Li introduced a concept that I’ve used for years in my consulting work to help leaders understand change adoption: Everett Rogers’ Diffusion of Innovations theory. They also introduced a somewhat newer concept for understanding technology adoption from Geoffrey Moore’s Crossing the Chasm. This section was helpful as I continue to think through the questions I have about how to drive social media adoption and social media’s connection to my organization’s and clients’ goals. The book came to a close by covering the characteristics of social media maturity in companies and predicting the future of the groundswell. Bernoff and Li envision a future in which the groundswell is ubiquitous and surrounds us “like a cocoon” – which is probably not too far from today’s reality. In addition to these practical points, I was glad to see that the book was not an all-out promoter of social media use for everyone, but instead provided truthful tips about the obstacles and risks associated with social media adoption. Some things I thought the authors could have spent more time on were measurement strategies and tools. Though mentions of measurement and ROI were scattered throughout the book, I think it would have been helpful for The Groundswell to provide a consolidated section with tips for measuring success after an organization has implemented the recommended strategies. Since the book left me wanting more on this topic, I went searching. One resource that I found helpful for more information on social media ROI measurement techniques was Brian Solis’ blog post, Calculate the ROI of Social Media. Since The Groundswell was initially published in 2008 (and even since it’s revision in 2011), a number of new analytical and measurement tools have emerged in the marketplace that could be added to the authors’ social monitoring toolkit. For example, tools like Sprout Social and HootSuite support social media management and measurement, and tools like Klout and PeerIndex provide insight into social media influence. I’d recommend looking to other sources for more details on social media measurement tools, such as Folio Magazine’s 2012 article and this blog post from Dreamgrow. Despite a couple of forgivable gaps, The Groundswell was remarkably helpful for me as I continue to think about my current and upcoming projects and how I might harness the power of social media. Starting small and planning for the long-term are definitely tips I’ll be using.